The Gwinnett Braves are the worst in the International League when it comes to hitting home runs, just 34 on the season, 8 behind the Lehigh Valley IronPigs (The Bulls are second in the League with 91). And that in spite of the fact that they play most of their games in a hitter-friendly park. So how come they got 2 last night? That’s 6% of all their home runs for all year! Sigh. Former Bull Desmond Jennings is back in town and he met one of the two clothing items I watch for among rehabbing major leaguers. He was in long pants rather than the knickers and stockings all the Bulls are required to wear, but he was wearing the minor leaguer-required batting helmet (two ear flaps, more cushioning) instead of his major league version. Recovering from knee surgery, he was more aggressive on the bases than I expected. He drew two walks and participated in the Bulls’ best shot to get back into the game in the 6th inning when he came to bat with the bases loaded. He got a gift, a 3rd strike foul popup dropped by the Braves catcher. But then had another long foul ball caught on a gutsy grab by the Braves right fielder. 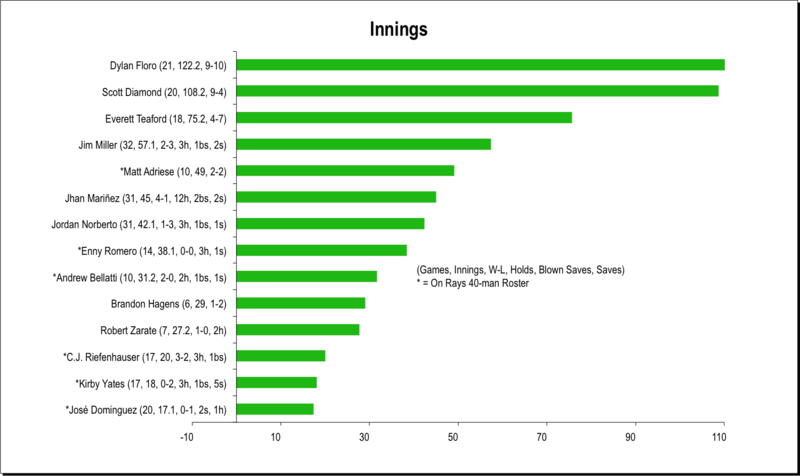 In addition to the home runs, miscues by the Bulls didn’t help. They had three errors, a passed ball, and a wild pitch that kept the anxiety level high even if they only one led to a run. They’ve had 12 errors in the last four games. This was our first chance to see Grady Sizemore in a Bulls uniform. He was playing left field and did not do well at the plate (most Bulls did not). The Bulls mostly got runners on base through the generosity of Braves pitching (8 bases on balls), although there was the dinger by Nick Franklin and timely shots by Ryan Brett and Richie Shaffer. Ah, but the blue moon that rose up from the east around the 8th. Wasn’t that spectacular? Now that’s something you won’t see at Tropicana Field. I left at the 8th and saw the beginnings what looked to be a enormous traffic snarl developing on the ramps to the eastbound Durham Freeway. To his credit, I also saw Bulls General Manager Mike Birling out there personally trying to sort things out with the road repairing crew at the key intersection of Magnum St and the freeway service road. I got lucky and was able to get on 501 north and back to my part of Raleigh on NC 98. I’m guessing that the post-fireworks crowd had some serious problems. My point is that Bulls folks were trying to figure it out for us. Here’s hoping they did. Mikie Mahtook got called up to the Rays and went 2 for 4 with an RBI playing left field in Boston. Kirby Yates got called up. Catcher Bobby Wilson was DFA'd and claimed off waivers by the Texas Rangers, so he’s gone. Infielder Jake Elmore is back from a long stint with the Rays. As noted above Desmond Jennings is with the Bulls on a rehab assignment. He would be with them through much of this home stand. Rehabbing Drew Smyly has gone off the roster, but that’s a day-to-day thing. If the Rays want him to pitch against AAA hitting, he’ll be back. The radio guys, Patrick Kinas and fellow Razorback Scott Poser, got chatting about August and innings pitched. Here’s how the current crew looks. 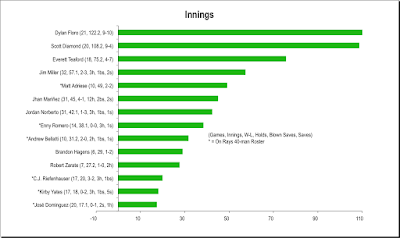 The chart does not include innings pitched elsewhere. For example, Blake Snell, not on the chart at all, has 98.2 innings this year at all levels.